The Boston Bruins travel to Prudential Center to play the New Jersey Devils on Tuesday, March 29, 2016. The opening line for this game has the Bruins at -135 and the Devils at +122. The over/under has been set at 5. Boston comes into this matchup having played 76 games. They have an overall record of 40-28-8 and on the road they have a record of 24-11-3. Currently they are 3rd in the Atlantic Division. They've scored 222 goals and given up 207 goals for a point differential of +15. The Bruins have 8 overtime losses including 1 of them in a shootout. In the past 10 games they have an overall record of 4-5-1. For the season they have an ATS record of 39-36 and an over/under record of 32-34-10. New Jersey shows up with a record of 36-32-8 including 17-15-5 at home this season. They are 7th in the Metropolitan Division. They've scored 171 goals and surrendered 193 for a goal differential of -22. The Devils have 8 losses in OT and 6 of them occurred in a shootout. They have a record of 5-4-1 in their last 10 contests. Their record against the spread is 36-40 while their over/under record sits at 25-35-16. Patrice Bergeron has accumulated 63 total points this season for the Bruins. He has 29 goals this season with 258 shots on goal giving him a shooting percentage of 11%. He has a total of 34 assists on the season and averages 20 minutes played per game. Loui Eriksson has averaged 19 minutes of ice time per game this year. In that time he has a shooting percentage of 16% by scoring 27 goals on 169 shots. He has 30 assists giving him a total of 57 points on the season. Tuukka Rask has 29 wins and 21 losses this season in net for the Bruins. He has had 1,744 shots against him and has given up 143 goals. He has made 1,601 saves for a save percentage of 92%. Mike Cammalleri has accumulated 38 total points this season for the Devils. He has 14 goals this season with 101 shots on goal giving him a shooting percentage of 14%. He has a total of 24 assists on the season and averages 19 minutes played per game. 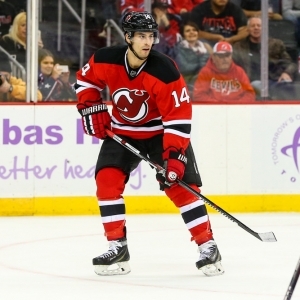 Adam Henrique has averaged 20 minutes of ice time per game. In that time he has a shooting percentage of 19% by scoring 27 goals on 141 shots. He has 19 assists giving him a total of 46 points on the season. Cory Schneider has 26 wins and 23 losses this season in net for the Devils. He has had 1,525 shots against him and has given up 117 goals. He has made 1,408 saves for a save percentage of 92%. The Bruins have 88 total points this season. They have scored 218 goals while giving up 206 goals. They have had 216 power play opportunities and have scored 45 goals on those chances for a percentage of 21%. The Bruins have allowed 250 power play opportunities and given up 44 goals on those chances for a penalty kill percentage of 82%. They average 32 shots per game and as a team are shooting 9.10% for the season to this point. They allow 31 shots to their opposition per contest and have a team save percentage of 91%. The Devils have a total of 80 points on the season. They have 46 power play goals on 226 opportunities thus far for a percentage of 20%. They have allowed 242 power play opportunities and have given up 43 goals on those chances for a penalty kill percentage of 82%. As a team, the Bruins have a total of 169 goals scored while they've given up 187 goals to this point. They average 24 shots per contest and have a team shooting percentage of 9.09%. As a team they give up 29 shots per game and have a save percentage of 91%. Boston has a Corsi percentage of 49.1% as they've attempted 4,284 shots on net at full strength while they've given up 4,434 shots on net in the same situations. Their Fenwick percentage is at 49.4% as they have 3,241 attempts while they've given up 3,315 shots on the defensive end. The Bruins start possessions in the offensive zone 49.5% of the time while their defensive zone percentage is at 50.5% for the season. They have 2,389 face off wins compared to 2,368 losses, meaning their faceoff win percentage is 50.2%. On defense Boston has 2,024 hits and they've blocked 1,119 shots from the opposition. New Jersey has attempted 3,351 shots at full strength and they've given up 3,922 attempts, meaning their Corsi percentage is at 46.1% for the season. In terms of Fenwick percentage, they currently are at 46.7% as they have 2,583 shots while they've given up 2,944 attempts on defense. The Devils have an offensive zone percentage of 47.1% and their defensive zone percentage is 52.9% so far this season. They have a faceoff win percentage of 46.3% as they've compiled 2,022 face off wins this season and they have suffered 2,345 face off losses. On defense New Jersey has blocked 978 shot attempts and they have 1,718 hits as a unit.